Clint Seller (Portable Shade Race! 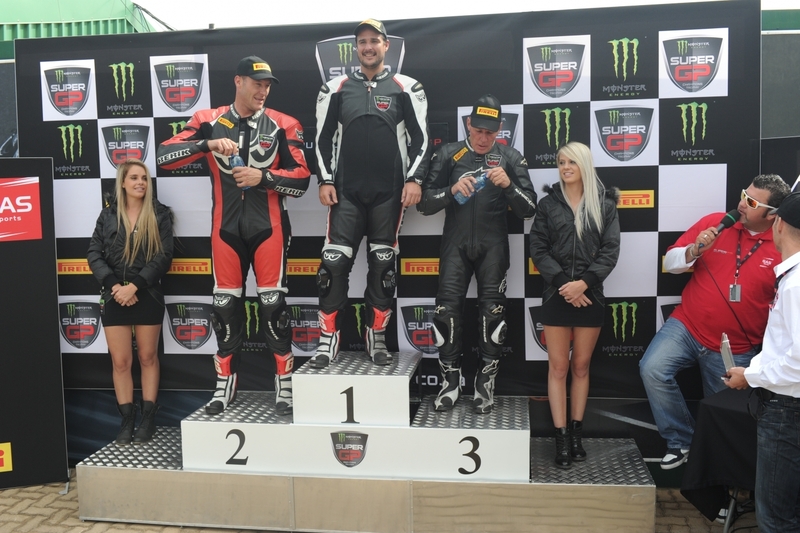 Kawasaki ZX10) and Brent Haran (Mantella Trading Kawasaki ZX10) shared the honours in round two of the Monster Energy SuperGP Champions Trophy at Red Star Raceway near Delmas in Mpumalanga this afternoon. Seller, winner of both races in the opening round at Phakisa Freeway in the Free State in March, looked set to repeat the performance after qualifying first and also winning the Top 15 Superpole on Saturday. He followed this up with a close 0,09 sec win over Haran in the opening 15-lapper despite riding with a painful shoulder injury picked up in a motocross accident two weeks ago. Third in race one was Lance Isaacs (Black Swan Energy BMW S1000RR), who led briefly after a great start from the outside of the front row of the grid and again at around half distance. Dylan White (Race SA Kawasaki ZX10) was a distant third, 8,47 sec behind the winner. On a mostly sunny day that saw the weather deteriorate in the afternoon and gusting wind making life difficult for the riders, Seller led race two into the first corner, followed closely by Haran and Isaacs. He ran wide on to the grass at the top end of the circuit, caught out by tyres that hadn’t warmed up sufficiently, and then dropped the Kawasaki as he tried to regain the circuit. He was not able to pick it up with his damaged shoulder and was forced to retire. Haran went on to take the victory – his first in the SuperGP category after just four races – by 2,87 sec from Isaacs. Ronald Slamet (Mike Hopkins/Novel Ford Kawasaki ZX10) recorded his best result of the year with third place, a further 25 seconds back and just three tenths of a second ahead of Ivan van Niekerk (Recon Racing Kawasaki ZX10). After the first two rounds, Seller, the reigning SA Supersport champion, leads the new SuperGP title chase with 75 points from Harran (71) and Isaacs (60). The two Monster Energy SuperGP races were the headline act in the new all-motorcycle national championship series that is being modelled on the FIM Superbike World Championship, with free practice and qualifying on Saturday and racing on Sunday. There were also two different winners in the Super600 category with Cameron Petersen (EmTek/Brother Yamaha R6) winning race one after dominating qualifying and Anthony Shelly (Fercor Projects Kawasaki ZX6) taking the honours in the second of the two 12-lap races. Petersen was followed home in race one by team-mate Dean Vos, who was just over three seconds behind at the chequered flag. 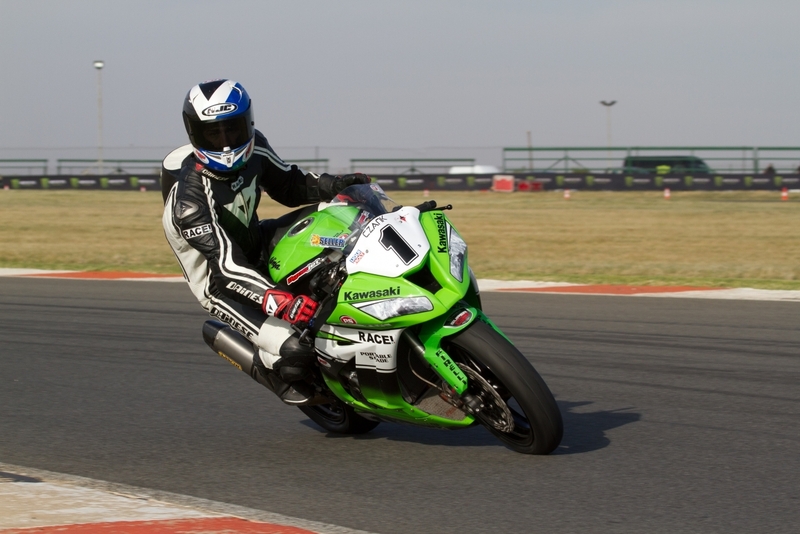 Stephen Odendaal (Portable Shade Kawasaki ZX6), back-to-back race winner in the opening round at Phakisa Freeway, was third. Shelly and Matthew Scholtz (Mantella Trading Kawasaki ZX6) both went down after contact, with Shelly managing to get going again to finish 16th and a lap down. Petersen, the reigning SA Supersport champion, looked set to make it a clean sweep for the day only to be knocked out of contention in race two when he was caught off balance by a strong gust of wind on lap five while enjoying a comfortable four-second lead. His Yamaha sustained a broken gear shift. Shelly inherited a lead he was not to lose and crossed the finish line less than two tenths of a second ahead of Dean Vos (EmTek/BrotherYamaha R6) and 3,67 sec in front of Odendaal. Odendaal leads the championship after two rounds with 79 points and is followed by Scholtz (60) and Vos (57). Kyle Robinson (Fantech Kawasaki ZX10) took two comfortable victories in the national challenge SuperM category, finishing over seven seconds ahead of Teddy Brooke (Brooke Refrigeration Kawasaki ZX10) and 7,7 sec in front of Justin Gillensen (Portable Shade Kawasaki ZX10) in the first 10-lapper. Robinson overcame a poor start that saw him drop to seventh from pole position. He was again the class of the field in race two, with Gillensen taking the runner-up spot this time, nearly nine seconds in arrears and 15 seconds ahead of Brooke. 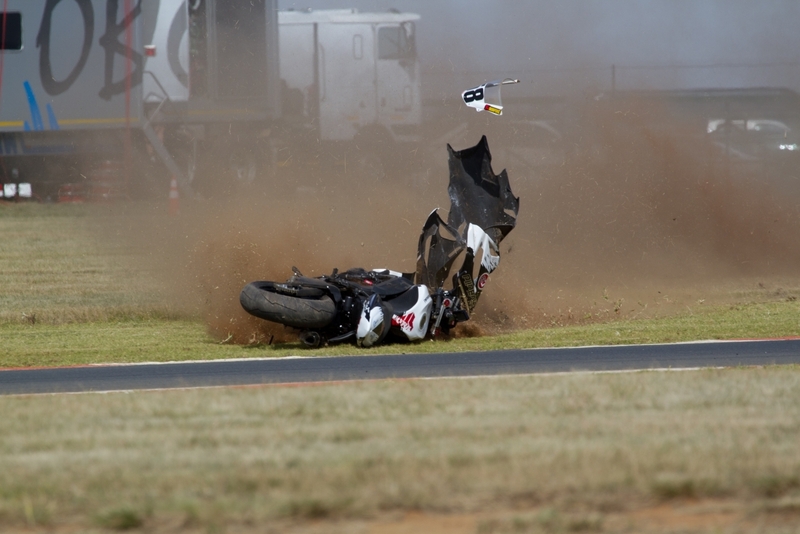 Brooke had to fend off a late challenge from Colin Lehmann (Ikageng Electrical Contractors Kawasaki ZX10), who closed to within four tenths of a second at the chequered flag. Janine Davies, who made history by becoming the first female rider to finish on the podium in a 1 000 cc race with her back-to-back third places in round one, dropped her BMW S1000RR early in the first race while chasing Robinson for third place. She recovered well to finish fifth in race two after catching Beau Levey (Motos KTM Klerksdorp KTM RC8) on the penultimate lap. Robinson heads the standings in the Super M National Challenge with 90 points and is followed by Teddy Brooke (60) and Ryan Ottens (50). The next round of the championship is at Cape Town’s Killarney circuit in the Western Cape on May 18.